Effectively an augmented catalogue of a 2010 exhibition at the Florence Griswold Museum in Old Lyme, Connecticut, With Needle and Brush joins a broad group of scholarly, handsome books on the subject of embroidery. Perhaps the earliest book on the subject of American needlework is the 1921 American Samplers by Bolton and Coe, followed by the work of Betty Ring, ﬁrst with contributions to the magazine Antiques and followed by Let Virtue Be a Guide to Thee; Needlework in the Education of Rhode Island Women, 1730–1830; Girlhood Embroidery: American Samplers and Pictorial Needlework, 1650–1830; and American Needlework Treasures. The publication of With Needle and Brush is very timely, especially given the planned January 2012 New York auction of Betty Ring’s personal collection. As more and more books have been written on American embroidery, many have been concerned with regional samplers and other needlework—Maryland, Virginia, and Ohio, for example. Some of the more recent books have delved beyond the objects themselves into the realm of the education of women in the America of the eighteenth and nineteenth centuries. 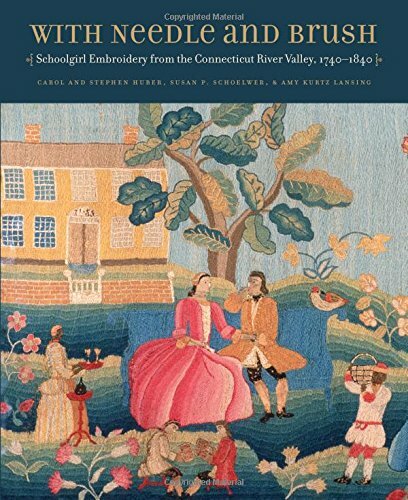 With Susan P. Schoelwer’s contribution to this volume as well as her own book, Connecticut Needlework: Women, Art, and Family, 1740–1840, we are treated to an examination of “dame academies,” with particular focus on the Patten school of Hartford, 1785–1825, this study being an excellent example of the term material culture. The level of skill and creativity demonstrated by many of the illustrated examples—entirely in color—will be of considerable interest to both men and women interested in the material evidence of this emerging nation. Another fascinating aspect of the objects chosen by Carol and Stephen Huber is the narrowness of the regional characteristics, attributable to the teachers in academies in Norwich, Middletown, Hartford, and Litchﬁeld in Connecticut; Westﬁeld, Deerﬁeld, and South Hadley in Massachusetts; Fitzwilliam, New Hampshire; and Windsor, Vermont. The Hubers have provided, in addition to these regional characteristics, four Boston needleworks for comparison. The academies were attended by students from more prominent and wealthy families throughout New England and nearby parts of New York state. Each catalogue entry is attributed to the student’s name, hometown, and location where the needlework was created, as well as the material used, size, and present location. This is the kind of history that doesn’t appear in textbooks. The quibbles: Plate 30 is described as having “two young gentlemen . . . all in front of a center-chimney house . . . ,” when the house illustrated actually has twin chimneys. The other two involve the book’s design. The display typeface is odd, combining capitals with lower-case forms, all at the same X height. As it appears on the cover, it’s not objectionable, but within, there are several situations where the cap T is followed by a lower-case r, causing the reader to stumble. More egregious is the reproduction size of the images, much smaller than would have been both possible and desirable. With the exception of these three quibbles, With Needle and Brush is a book of fascinating visuals married to a new way of exploring American history—most notably the story of the visual and creative contributions of girls and their teachers in early America. A most worthy addition to the literature of early American decorative arts that also describes in detail an important aspect of the history of American education. Jonathan Rickard studied art and has a BFA from the Massachusetts College of Art and Design, Boston. A published author, he studied writing at Wesleyan University and completed a memoir about paralysis, hospitalizations, and a love affair while a member of a writers’ workshop in Middletown, Connecticut.